Fabric: Home for the Holidays Collection pg 2 - Home for the Holidays Collection is by Riley Blake. Home for the Holidays Collection is by Riley Blake. 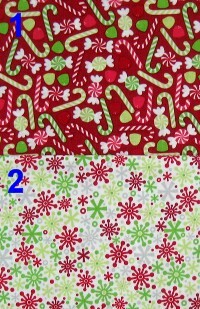 ONe of these fabrics has candy canes and peppermints. The other fabric has snowflakes.